Happy Sunday! Awards! Q&A! Oh my! I’ve been neglecting to do this but it’s time. I think in the future I’ll just use this post to continue with award giving. I’ve received some awards as of late that I have as yet failed to properly pass on. 1.Pass the award to 15 other blogs that you’ve newly discovered. Tara at The Bloodcrossed Writer gave me the Honest Scrap Award. Rules are simple: Copy the picture to your own post, list five more of your favorite honest bloggers, then open the blog to personal questions from the audience. Leave questions for me in the comments if you so desire and I’ll get to them this week. Roni at Fiction Groupie gave me this one. I like the image of it. Rules: Include the award logo in your blog or post. Link to post where you received the award. 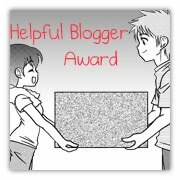 Nominate seven blogs that you feel are helpful to others. Let them know they’ve received the award by commenting on their blog. Share one thing that no one knows about you & quote a sentence from your favorite book. One thing about me: My biggest weakness is Swedish Fish. I’d rather get those over flowers or chocolates any day. All the blogs I follow are helpful, so you’re all getting it. If you’re a follower of my blog or I follow yours, you get this award. Quote from a book: Can’t think of any off the top of my head. Sorry. Footloose and Fancy-free Friday Second Edition! Congrats Stephanie! What are Swedish Fish?! Thanks, Deb! Swedish fish are these yummy gummy candies that are, oddly enough, now made in Canada. They're still made in Sweden, where they originated, but the ones available in the US come from Canada. I love them. Here's the wikipedia article. Thanks for the award, Stephanie! Swedish fish are yummy, but I've always liked Sour Patch Kids more if I'm going for gummy. Wait, did that rhyme? Ohdalolly! Congrats on your awards! All of them are deserved. Stephanie, you deserve it. Your blog is fabulous. As for the candy, I've never been able to acquire a taste for the uber-sourness of Sour Patch Kids. Roni, you deserve it, too! Yours is one of those blogs that I can't not read. Aw, thanks for the award Stephanie! And congrats on getting all of these!! Congratulations on all the awards! And to all the winners- you deserve them too. Oh, Stephanie! That's so nice of you. Thanks! Congrats to you and to all of the winners! 🙂 I LOVE Swedish fish! They're probably my favorite movie-going candy after Raisinets and Crunch. L.T., a great award for a very deserving person! Blog on! Yeah! And thanks! Windy, you're welcome! You're totally deserving. Julie, oddly enough, I don't do Swedish Fish at the movies. That would be Red Vines. And nachos. Cursed diet. Thanks!